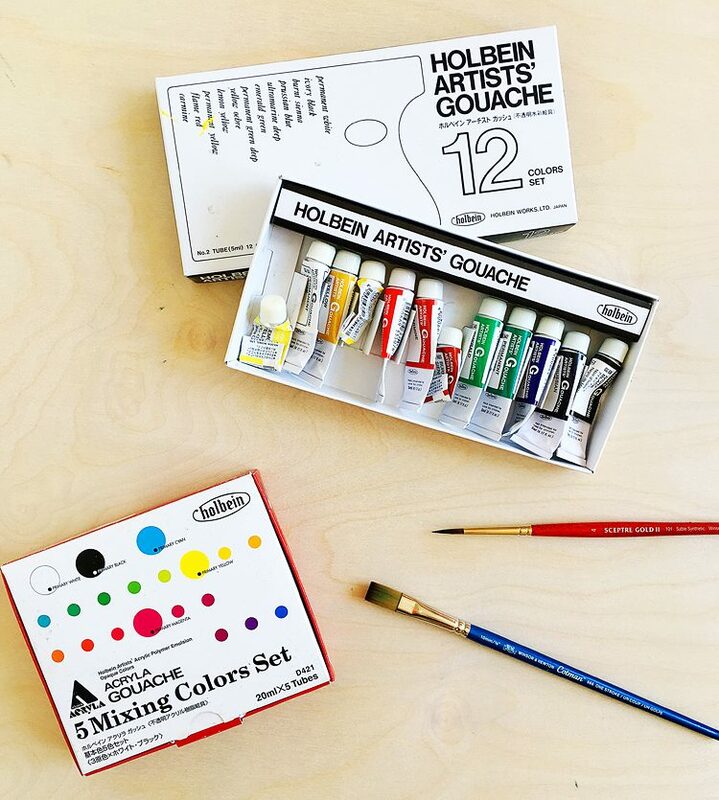 Holbein artist gouache and acryla gouache sets. In this post I thought I’d share what I’ve learned — here goes! First off — what the heck is gouache, anyhow? Well I think of gouache — rhymes with squash — as a hybrid between acrylic paint and watercolors. It was used for print and advertising illustrations since it has a flat finish that makes it easy to reproduce. You can get really good coverage in big areas without showing brush strokes, too. Also, you can layer LIGHT colors over darks — a total game changer compared to watercolor! If you’re working with non-acrylic gouache then you do have to be careful not to overwork it and reactivate the layers. But still, so cool! There are two kinds of gouache, one that is (sort of) re-wettable/reactivates with water and one that will dry hard in the same way that acrylic paint does. The sorta-re-wettable gouache is usually called artists’ gouache or designers’ gouache, while the one that dries permanent usually has something like “acryla” or “acrylic” in the name. Check with the manufacturer to see what flavor it is. 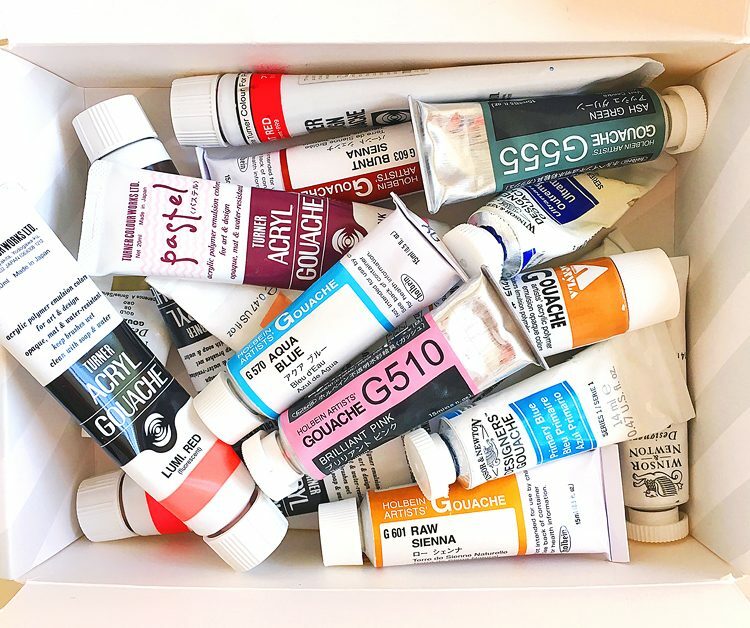 There are pluses and minuses to each kind: the acryla gouache that dries permanent is great for adding lots of layers or mixed media without the worry of the paints getting reactivated and making a muddy mess. 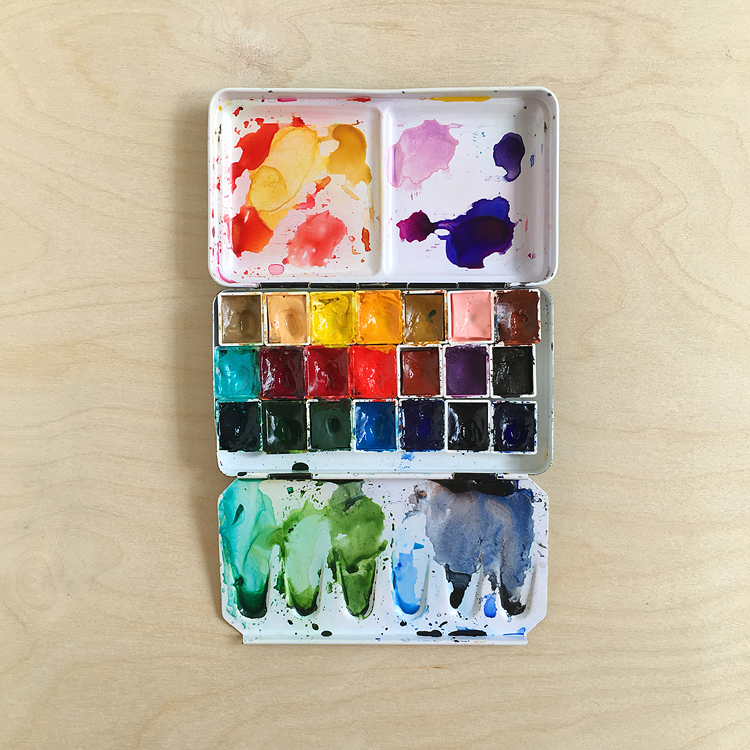 The artists’ gouache lets you put some on a palette and then reconstitute it so you waste less. It doesn’t behave quite the same as gouache fresh out of a tube tho — it’s a little grittier. You do need to add a little bit of water to the paint to get it to flow — usually just what’s on your brush is enough. So, the binding medium for watercolor is gum arabic, which is sap from an acacia tree. It’s usually dissolved in distilled water and then honey and glycerin are added to help with mold retention and to help keep the paint moist so that it rewets easy in the pan. Artists’ gouache is pretty much the same as watercolor but with the addition of chalk to make it opaque — so the same gum arabic binder. And that’s where the similarity to watercolor ends — to lighten watercolor we mix it with plain water, but to lighten gouache you mix it with white gouache. Adding too much water to gouache really changes the consistency and makes it kind of streaky and blah. Acryla gouache uses a binder more similar to acrylic paint — back to the sand painting, it turns out you can make acrylic paint with PVA glue + pigment — who knew? I want to try that someday! Acryla gouache dries to a flat matte finish tho, unlike most acrylic paint. Whew, hope that’s not too much info! I started off by using a plate for a palette and discovered that my gouache would start drying out while I was painting — especially in the summer! Also I wanted to mention that as far as the artists’ gouache that can be reactivated in water — I’d say that this is a very limited reactivation, depending how long the paint has been out of the tube and your climate. I’ve tried putting various brands of artists’ gouache in one of these Meijello “air-tight” palettes and after a couple weeks the paints were really dried out and hard. I tried misting them with water and let them sit for an hour — still no go. So if you live in a place like I do where it’s hot and dry I’d highly recommend a “sta-wet” palette like this one — best $10 palette ever! 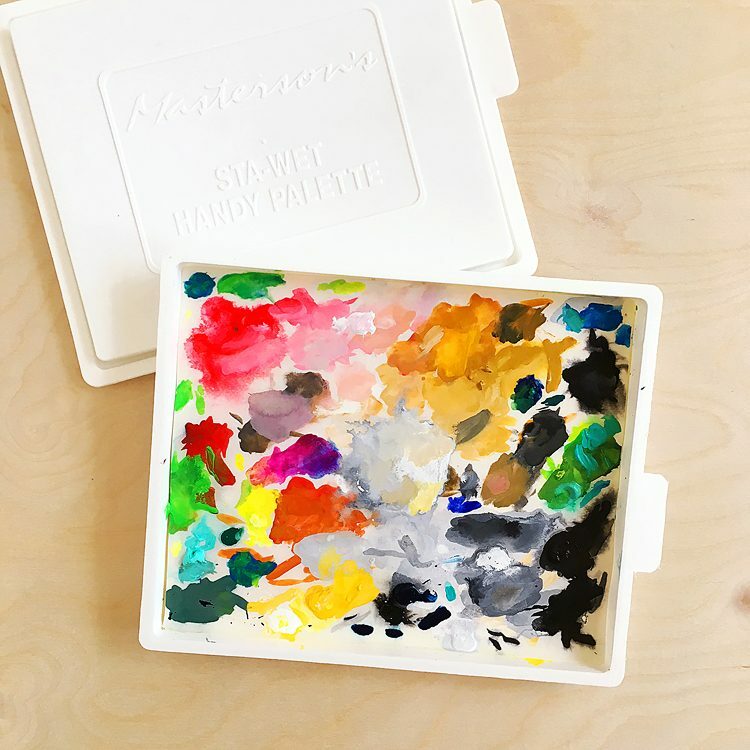 The Masterson’s “sta-wet” handy palette has a sponge and palette paper to help keep paint moist. You set it up by letting the sponge soak in water until it expands and then gently get rid of some of the water, then soak the palette paper and place it on the sponge. You can rinse off the palette paper and use it several times before you need to switch to a new sheet. One thing I’ve found is not to let the sponge get too wet or it will make your paints all runny…! Since gouache is basically made from the same ingredients as watercolors it’s no surprise that you’ll find the same players here! Winsor & Newton designers gouache – this is one of the first brands of gouache that I tried — love their white, jet black, gold and opera rose — a bright pink. Winsor & Newton gouache is re-activated in water — they don’t have an acryla version. They have this mixing set that would be a great way to try out gouache. They also have this introductory set that I got to use at an in-person workshop with August Wren — it’s got more colors for more cash. Holbein – they have artists’ gouache and acryla gouache sets that are reasonably priced so that you can try them out. I love their raw sienna, burnt sienna and brilliant pink (formerly shell pink). The ash green is also great for yuccas. Both the artists’ and acryla gouache perform equally well. So I’d say you really can’t go wrong with any brand, except for maybe that M. Graham unless you mix it with white gouache. If you’re just starting out and want to try gouache, I’d say to try one of the mixing sets in either acryla or artists’ — OR do what I did and get a few colors you love to try first. I’ve found yellow really handy for adding to flower centers, white for adding highlights, and black for a really strong black. Bonus: you can mix watercolors with white gouache to tint it, so if you’re just getting started I’d say white is a no-brainer. Oh and you can mix brands and types of gouache as well. Before I go I wanted to add one note about brushes — while you can use the same brushes for gouache that you do with watercolor, gouache is really hard on brushes due to the chalk. So I wouldn’t use your best brushes. I like to use Winsor & Newtwon Cotman or Sceptre Gold II when I’m working with gouache. Just let me know if you have any Q’s! Wow, I know a lot more about gouache now! Thanks! Thanks for all the info on gouache! It’s like having a mini class and I learned lots. I have some white gouache and will try mixing it with some watercolor before I purchase colors of gouache. Thanks for the tip on not using your best watercolor brushes for painting with it. Hi Barbara! Yay glad it helped! Have fun experimenting!